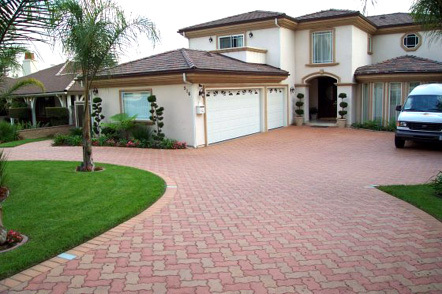 Installing a paver driveway is an excellent decision for most homeowners: you will see financial, aesthetic, and structural benefits from using paving stones for your next driveway project. This material is a great choice especially if your driveway experiences heavy traffic, as concrete paving stones are a great way to preserve your driveway against the elements and your vehicles while simultaneously beautifying your home and increasing its appraised value. Planning, designing, and constructing your new paver driveway will take a lot of work – and with lots of work comes the need for information. This page will attempt to give you everything you need to know in order for you to make an informed decision. Since you’ll be putting a ton of money and time into this, it’s best if you know as much as possible about the process. First, let’s discuss why you’d want to pick pavers over the other materials that are often used for driveways. 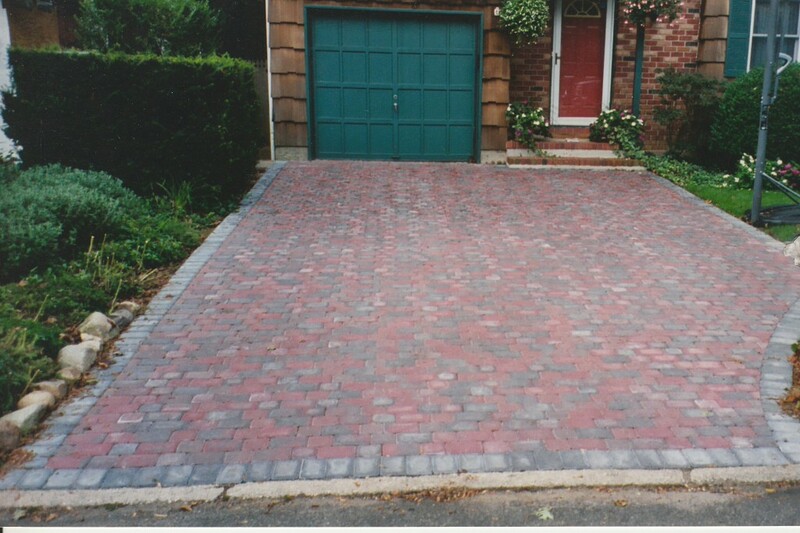 An example of well-designed and installed driveway pavers. There are many options out there for the material used to build your driveway. Besides a paving stone driveway, your choices include stamped and poured concrete, asphalt, or stones. Each has its advantages and disadvantages. You can find more information about these pros and cons on other areas of this site. The main three winning features of pavers we will focus on in this article is cost, strength, and longevity. However, the driveway will pay for itself over time, both in lower maintenance costs (money and time) and sheer longevity, as you will probably not be forced to replace the driveway for decades. The reason why this occurs is due to the structure of paver driveways versus the other options. For concrete and asphalt driveways, the project ends up being one huge, connected slab. While strong (but not as strong as interlocking pavers, actually), this slab does not do well with freezing and thawing cycles. As water freezes underneath the slab, it forces itself into it. The slab cannot bend, so in response it cracks. As freezing and thawing continues, these cracks get worse, eventually forcing you to install a new driveway. However, for pavers, this is not a problem. The bed of aggregate underneath the driveway is strong yet flexible. In addition, the joints between the concrete pavers give them the best of both worlds: strength and flexibility. These driveways will not crack due to any freezing or thawing. Slabs do have the advantage of not being susceptible to settling, while interlocking pavers sometimes do settle. However, this is easily fixed, as the offending pavers can be removed and reset as necessary. Overall, the maintenance and replacement costs are lower for paving stone installations than for other options over time. The fact that these driveways add property value to your home is just more icing on the financial cake. All of this results in a durable paver installation that will withstand the rigors of driving, parking, and weathering. In many ways, it is as close to ‘set it and forget it’ as you can get in the home improvement world – as long as it is installed correctly and with attention to detail! Of course, if you are interested in pavers in general, there are many options to look at besides the concrete variety. You could try natural stone pavers, such as granite, travertine, bluestone, cobblestone, and flagstone pavers. These will be much more expensive, but many people prefer the look of this material. You could also try brick pavers; these are made out of clay. In addition, you can try grass driveway pavers and other permeable options if form and function are your primary concerns. There are still other options, such as using thin pavers over an existing concrete slab, or installing rubber pavers. However, with concrete paving stones you will find the best balance between selection of sizes, shapes, and colors, beauty, value, and durability. The other options will suffer in one of those areas or another but will be better in other areas than the concrete variety. A driveway with an interesting design flair - installed circle kits are shown here. For anyone with little experience designing a concrete paver installation, figuring out exactly how to set up the driveway can be challenging. If you hire a contractor or designer to do the work or give suggestions, the work is done. But here are some general ideas and tips to think about. The first thing to figure out when deciding on a driveway for your home is the size of the project when it’s finished. You could just build the driveway in the same size as your old driveway, or you could choose to expand the driveway to give you more parking room. In addition, consider adding other complementary features – walkways, stoops, patios, and the like – to get the biggest bang for your design and installation buck. Aside from the size and shape of your driveway, you also need to consider the various patterns you can lay it in. These patterns have been described elsewhere on the site, but for now realize that different patterns can have different consequences for the look of the driveway. You’ll also want to consider the color options, and how the color blend you select will interact with the pattern, shape, and size of your driveway, as well as the other features of your home, landscape, and general environment and decor. Also consider the various types of edging for your driveway, as some will be more expensive than others but provide more benefits. Consider this carefully, especially if you have a lawn, garden, or flowerbed nearby that you will want to preserve or cordon off. Other options for boundaries between your driveway and your yard and home include all kinds of walls and retaining walls. 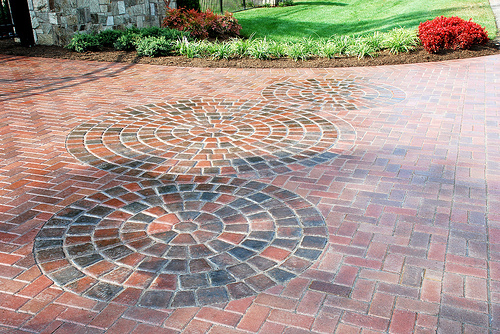 There are also special designs you can incorporate within the driveway. One example is the use of the circle kit to add circles to the driveway – shown in the photo above. Another design option to think about for your driveway is an “apron,” or the part of the driveway closest to the entrance. Some customers decide to put a fancy design there, like fans, though of course the options are limitless and it’s ultimately up to you to decide. No matter what your design choices, a paving stone driveway will look great. Since your driveway is one of the first things visitors see in front of your house, you will be sure to make a good impression with this installation. When designing and implementing your ideas, make sure you take into account the environment (is it hot or cold, generally? Rainy or dry?) as well as the soil or material naturally occurring in your front yard. Make sure you communicate this information to your paver contractor, as it could seriously affect your project.If you plan on hiring a contractor to install your driveway, make sure they have experience in this area. These are usually big projects and require working on a scale that some may not be comfortable with. If you are installing the driveway yourself, there are a few things to keep in mind. Because there will be vehicular traffic, you will need to make sure your aggregate base is deeper than usual – anywhere from 10-14″ of compacted, aggregate base will be necessary to give you driveway pavers the necessary foundation. Furthermore, keep in mind the “pitch” or the slope of your driveway. Make sure water will flow off it, preferably into your yard or the street, and not simply stand in place. The worst outcome of all is that water flows back into your house, potentially flooding the basement. Note, however, that the paver surface will be somewhat porous due to the joints, so some water will drain through the structure. Make sure you design your driveway with the proper amount of pitch to prevent any damage to your or surrounding homes. This may require some extra excavation or the addition of fill to properly grade out the area. When designing and implementing your ideas, make sure you take into account the environment (is it hot or cold, generally? Rainy or dry?) as well as the soil or material naturally occurring in your front yard. Make sure you communicate this information to your contractor, as it could seriously affect your project. The cost of your driveway will depend on a number of factors, some of which are described elsewhere on the site. To get the pavers installed by a contractor, you’re looking within a range of $10 to $20 per square foot. Of course, the pavers cost will be lower if you get the pavers for sale or if you do it yourself, among other factors. As mentioned above, maintenance of your paving stone project will be minimal compared to other materials. However, periodic cleaning and sealing of the surface will help preserve its beauty, color, and strength. You can obtain driveway sealer and apply it yourself, making for a cheap and quick DIY paving project. This entry was posted in Project Ideas and tagged advice, driveways, installation, projects by Will Grander. Bookmark the permalink. In 2009, I hired a professional contractor to install 2000 sq feet of pavers on my driveway. Techniseal RG + Polymeric sand was used to fill the joints. Four years later, the paver joints are accumulating black algie and weeds. I cleaned the joints using a pressure washer. I am now ready to refill the joints with sand. I would like to know if there is a joint filler available that will not grow algie and weeds?